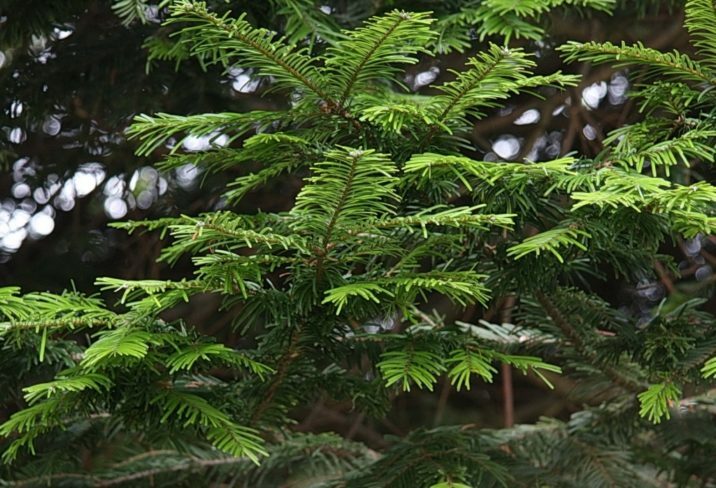 Abies grandis, as described in 1833 by (Douglas ex D. Don) John Lindley (1799–1865), in The Penny Cyclopædia of the Society for the Diffusion of Useful Knowledge, is commonly known as Grand or Silver fir; as well as sapin grandissime in the French language. 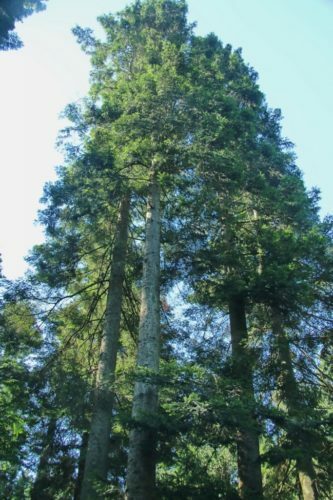 The species name reflects this conifer's status as the tallest-known fir species. Ethnobotany. 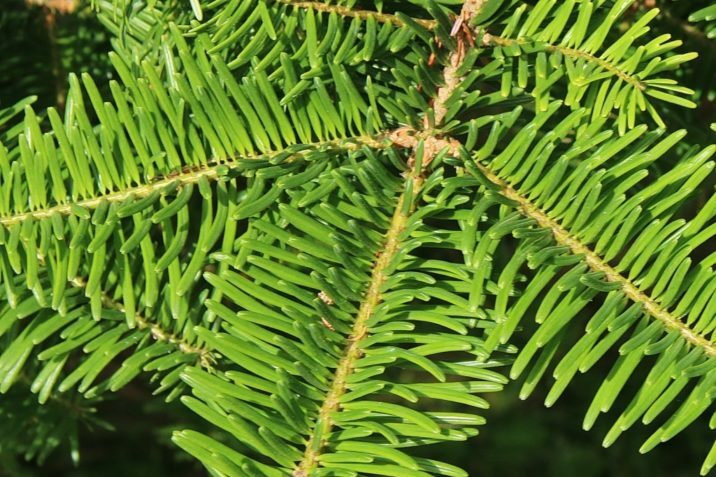 The inner bark of the grand fir was used by some Plateau Indian tribes for treating colds and fever. 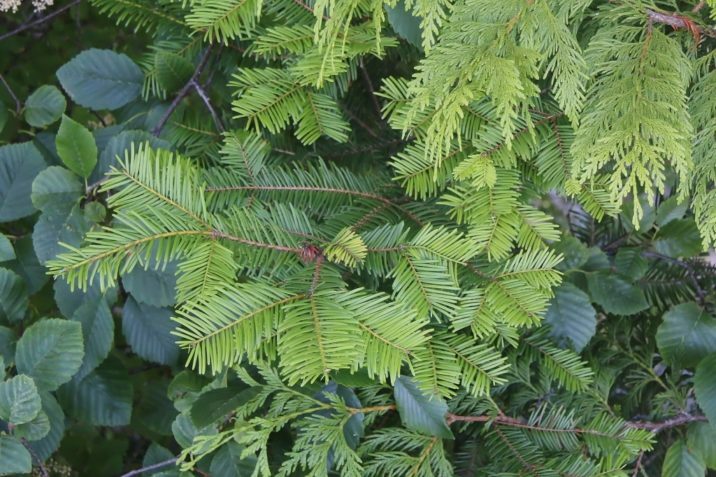 The foliage has an attractive citrus-like scent, and is sometimes used for Christmas decorations in the United States, including Christmas trees. 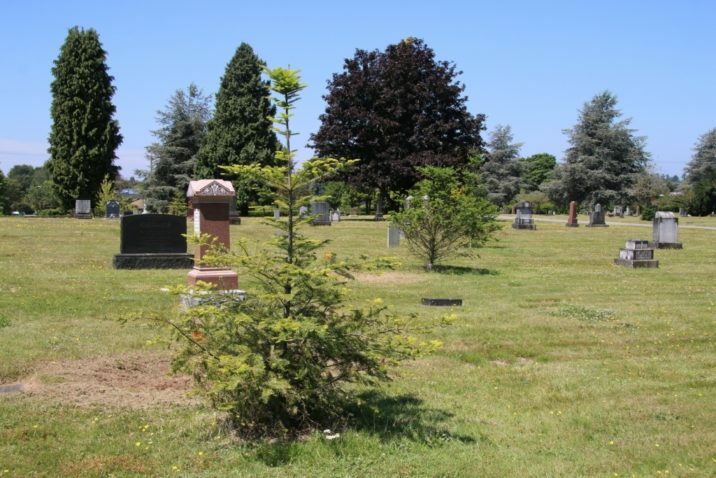 It is also planted as an ornamental tree in large parks. Robert Van Pelt's drawing of the largest known grand fir, on the Duckabush River in Olympic N.P., Washington. Description. 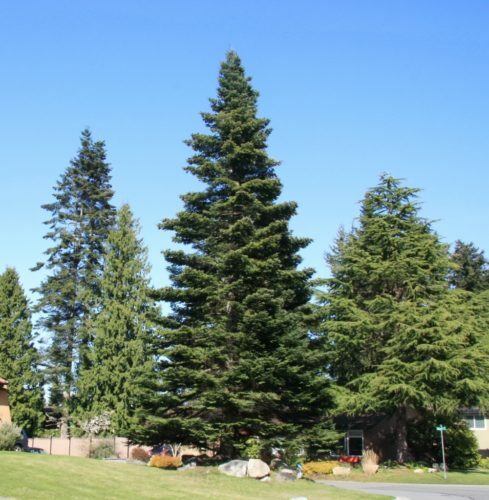 Grand fir is a fast-growing, evergreen coniferous species of tree that grows to mature heights of 260 feet (80 m) tall; with a trunk up to 62 inches (155 cm) in diameter, measured at breast height; and a crown conic, becoming round-topped or straggly with age. 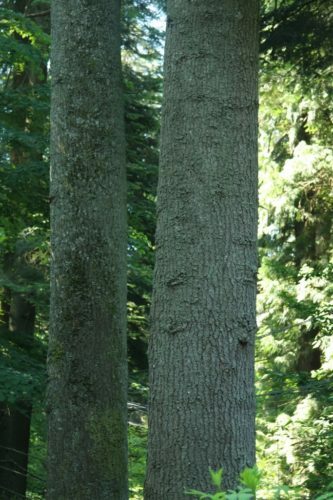 Bark is gray in color and thin when young; thickening and becoming brown with age, often with a reddish periderm visible in furrows bounded by hard flat ridges. Branches grow spreading, and drooping. Twigs are mostly opposite, light brown in color, with pubescent texture. Foliar buds are exposed; purple, green, or brown in color; with a globose shape, small to moderately large in size; resinous; with a rounded apex. Basal scales are short and broad, with an equilaterally triangular shape; a slightly pubescent or glabrous texture, and resinous. Margins are entire, with pointed or slightly rounded apices. 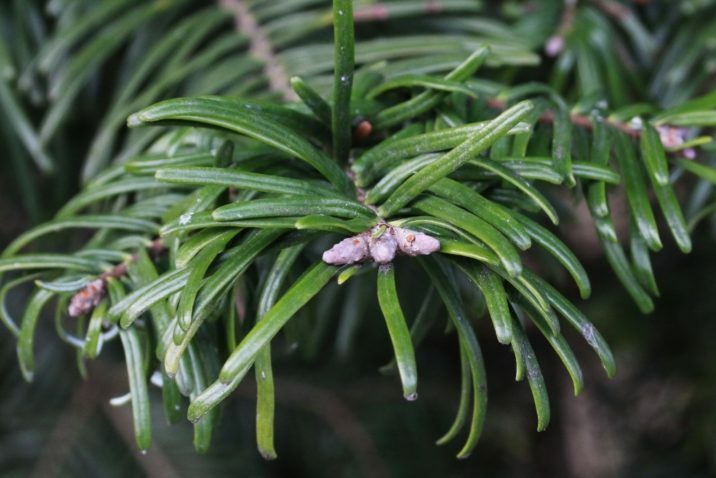 Leaves (needles) are sharp-tipped, and arranged in 2 distinct, flattened rows, colored dark glossy green above and greenish white beneath, with large white bands of stomata on the undersides - giving it a silvery effect when looking up from below, hence common name Silver fir. Individual needles measure 0.8 to 1.4 inches (20 - 35 mm) long by 0.08 inch (2 mm) thick. Seed cones are cylindrically shaped, measuring 2 to 4 inches (5 - 10 cm) long by 1.5 to 1.7 inches (3 - 4 cm) broad, colored light-green or purple-tinged when young, maturing to a dull grey-brown, and are usually very resinous. Distribution. This species is native to southwestern Canada and northwestern USA south to northern California, found at elevations from sea level to 5,900 feet (1,800 m). The plant is tolerant of most soils that are deep and moist. Hardy to USDA Zone 6 — cold hardiness limit between -10° and 0°F (-23.2° and -17.8°C). 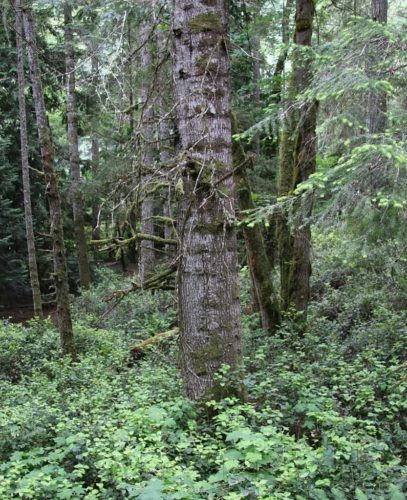 Attribution from: Richard S. Hunt, Abies. Flora of North America Editorial Committee (editors); Flora of North America North of Mexico, Vol. 2; ©1993, Oxford University Press. 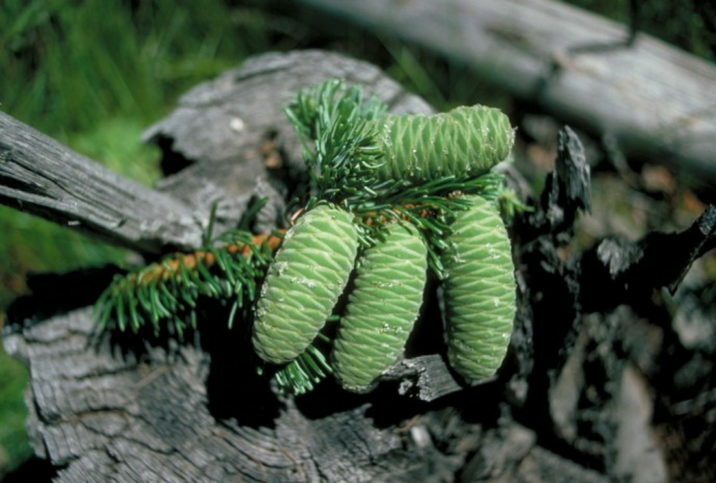 Abies grandis — fragmenting cones are generally pendant, unlike most Abies species. Abies grandis — bark detail of trees living in Joffre Lakes Provincial Park near Whistler, B.C.